About PvsP. Past vs Present. Hwa Chong Past vs Present was started in 2008 to provide past and present Hwa Chong Institution and Hwa Chong International School students a platform to gather and engage in friendly sports competitions on the morning of the Mid-Autumn Festival (MAF) Celebrations. 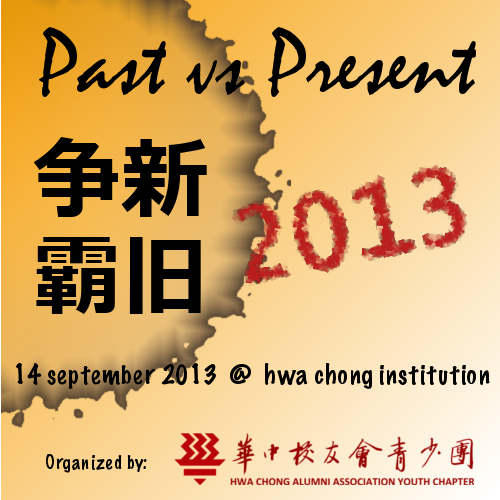 PVSP 2013 will be held on 14 September 2013 (Saturday) morning at Hwa Chong Institution (College Section). About the Youth Chapter: As Hwa Chong leaps forward into the future, it is more important than ever for the school to have a strong and vibrant alumni association to ensure her continued educational achievements and legacy. The Youth Chapter aims to inspire Hwa Chong alumni to contribute to their alma mater through pioneering alumni activities. Complete your Hwa Chong journey by joining the Youth Chapter today.